The evolution of the Element X continued with the release of versions with recessed SPR axle systems. That is the halves were machined so that the response surfaces for the SPR system were flush with the yo-yo halves. The Playa featured a recessed large bearing SPR axle system. Like most of the Element X line, colors varied widely. Very many combinations of body color, weight ring color, and logo color. 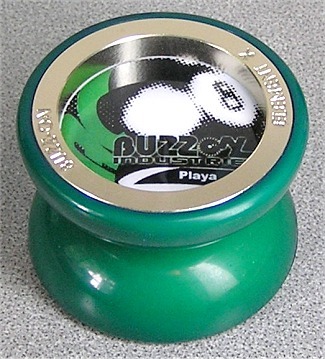 Pictured here is a Dark Green Playa, from the first release with standard production side caps.